There are thirty-nine or so species in the genus Aciphylla, and from this image alone it is impossible to be certain of its identity. Douglas Justice and David have tentatively identified it as Aciphylla squarrosa, one of the most common species in cultivation. 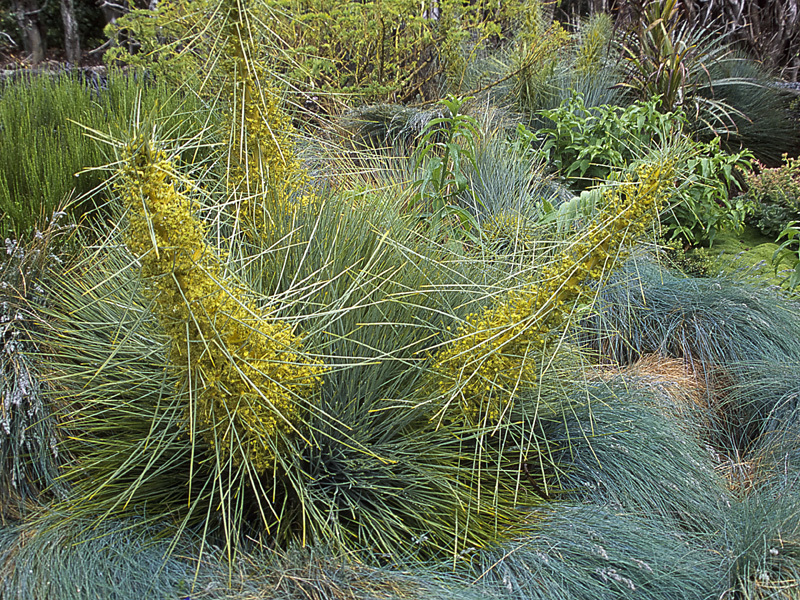 Common names for Aciphylla squarrosa include taramea, speargrass, and my favourite, common Spaniard. To understand the latter, you’ll need to recall that when these plants were first learned of by European explorers, the Spanish were associated with swords. The resemblance of the sharp, long leaves and bracts to the Spanish weapons doesn’t require too much lateral thinking. Plants for a Future Database’s entry on Aciphylla squarrosa includes references that suggest the cooked root is edible – perhaps not surprising, as it is related to carrots and parsnips. Using other plants in a family as a guide to determine potential edibility is not advised, though. After all, all three are also related to the deadly poison hemlock. Photography resource link: There is much to like about the work of Daniella T. from California – I particularly like the images from Joshua Tree National Park and Sequoia National Park in Winter. Zone 5 for a New Zealand native is highly improbable. I’d say zone 7 (for high alpine species on South Island) or 8 is more realistic. My book of native New Zealand edible plants reckons that Spaniards are edible, although it doesn’t give them a great rating on taste, I think. Can anyone explain the zones being discussed in previous comments a little? Spaniards certainly aren’t restricted to high-alpine areas in the South Island only – and Lanarch Castle is certainly not that high above sea level, really. It’s on a hill, but a hill in a port city. So I’m not sure I’m understanding what is meant about the zones. “reckons that Spaniards are edible” . . . must remember that next time I go to Spain! The zones are plant hardiness zones devised by the US Dept of Agriculture; the zone number is related to the average coldest temperature recorded each winter. Zone 5 means between -23°C and -29°C; as this is an average with half of winters colder-than-average, that means to be hardy in zone 5, a plant must be able to tolerate severe winters down to about -35°C or -40°C. Temperatures in New Zealand, even at high altitude, never get that cold, so NZ plants won’t have had the opportunity to evolve tolerance to it. The altitude of Lanarch Castle doesn’t matter as the plant is presumably planted there rather than growing wild, which is what matters in terms of the coldest temperatures a species is adapted to. Thanks very much. That makes lots of sense. The most common Maori name of this plant is ‘Karamea’.